If you recall about 2 months ago I posted that I would be leading my very first all women's small group. 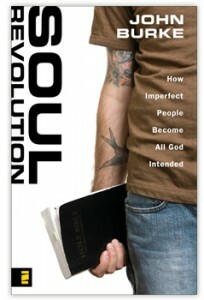 We read and studied the book Soul Revolution written by our church's lead pastor, John Burke. In short, the book is about how imperfect people become all God intended. We were challenged to spend time with the Lord every 60 minutes for 60 days. And that 60 days ended about 2 weeks ago. I have been praying about writing this post and today was the day I would post it. I wanted to share my thoughts and prayers I had along this journey and how this book changed my life. We also talked about and explored the things in each of our lives that are keeping us from this connection with God. God gives us free will and the ability to choose because love requires choice. If we put things that are worth less than God before God, we begin to feel worthless. We were created to do life with God yet our lives can get in the way. We prayed for the Lord to reorient our spiritual eyes to see who He really is. In part 2 we each set a stopwatch or time to go off every 60 minutes to remind us to spend time with God. This took some getting used to. It was definitely a thrill at first but got kind of annoying. I was lost and confused about what to say to God when I had already talked to Him 3 times that day. In many of the conversations I had with God in those first few days of the experiment, I asked Him to show me His will for me in that very moment. I asked him what He wanted from me right then and there. I also spent a lot of time thanking God for things I often forget to thank Him for. Little did I know those conversations would get deeper and more meaningful and change my life forever. I was amazed how hard it was for me to talk to God so often. All He wants is my love and my heart and I am wasting my day on the computer! "As the Father has loved me, so have I loved you. Now remain in my love" John 15:9. The bible makes it look so easy to be connect with God. Abide/remain in His love, follow His instruction, and love others as He loves you. Yet why is it so hard for us?! The only way in life is to walk with the spirit. "But the fruit of the Spirit is love, joy, peace, patience, kindness, goodness, faithfulness, gentleness and self-control. Against such things there is no law. " Galatians 5:22-23. I prayed for the Lord to continue to encourage me and guide me on my walk with Him and in this experiment. I wanted Him to help me pinpoint the things that were keeping me from following His lead. This part helped our group come to terms with conflict resolution and what the bible says about it. This was such a great tool for me and even though I am lucky to be in a season of minimal conflict, the bible is the perfect place to go for help. Something that really stuck out to me in one of the chapters was this quote from John Burke, "God wants to climb into the ring of conflict with us, to teach us how to fight for what's right, how to fight not to win the argument but to win the relationship." There have been two times since reading this part that Jon and I have been in arguments that ended in prayer. I honestly can't remember the basis for the arguments but I remember God pulling at my heartstrings to come to Him in the time of conflict. And guess what, it worked! Even though Jon didn't do the study with me, we are working on making prayer a way of life. Speaking the last 10%-saying the truth in love. This was the most powerful for our group. Speaking the last 10% is about sharing your heart completely and genuinely. Not letting judgement scare you from coughing up your baggage. I can still remember the night when each of us spoke our last 10%. Through tears and laughter, we become stronger as a group and stronger as children of God. The most important part to me from this section was being intentional with my faith. Every 60 minutes I found myself being in deeper conversation with God. Not thanking Him for things and not even asking Him for things. Just being with Him. Being connected. Letting my worries and worldly cares slip away to be in the moment with my creator. But it wasn't all kittens and rainbows. I still had work to do. We all kind of confessed to going through a slump during these chapters, finding ourselves annoyed and too preoccupied when our alarms would go off. I prayed that God would help me tear down any hindrances or habits that stood between my radical connection with Him. Was it my behavior, my attitude, a nasty habit, or a current event that was keeping me from being authentic with God? The book of Matthew outlines how we should pray. Don't babble. Don't pray just to be seen by others. Give thanksgiving, Supplication. Be authentic. Be intentional. The Lord knows the true desires of your heart. You will remember a few weeks ago I wrote a post about spiritual gifts. Well this part of the book is what inspired that post. It is so beautifully written in Romans. Just like each of our own bodies, we are a body in Christ. We each have different talents, functions and gifts...that work together to serve the Lord. I often times wonder what people mean when they say "Yes I am spiritual but I'm not religious" or "I believe in God but I don't go to/believe in church". It brings me back to this verse. If God created us to do life and to do church with others, how are those people doing it? Are they walking alone? God created the church and created religion for us to bind together, spread His word and share his wonderful gifts! If you aren't getting fulfillment from church, small groups, bible studies, reading the bible...how are you doing it? How can we be the Body of Christ with each other in this group? How can we as a group be the Body of Christ to our world? I didn't go too much into detail about these chapters but I encourage you to read my post from a few weeks ago about spiritual gifts and being the body. I have learned some beautiful things during this study and made some amazing, life long friends who I will continue to walk with in our faiths. But the most important thing I learned was spending time with God. Authentic, real, one on one time with my Heavenly Father. No I am not spending time with God every hour on the hour but I find myself wanting to call on Him. I find myself talking to Him on the way to work. And wanting Him to be the first person I tell (and thank) when I have something great going on. I am still learning and growing but this was a huge step in my spiritual growth. Another thing I loved in this book was real life stories and experiences of people at my very own church!! It was comforting reading about people who were lost, addicted, unhappy, skeptical, etc coming to faith after this book. It was pretty amazing. I highly recommend this book to anyone no matter what stage you are in your faith. And I recommend you find a group or a running partner. Please please please let me know if you have any questions about this book, it changed my life and I hope it can change yours too. What an inspiring post! I'll have to grab a copy of that book. I love that you wrote, "love is a choice." I remember thinking to myself, I need to get back into the church thing but wasn't making the time to go. The first time back to church in a long while was the first weekend I moved to Austin and I went to Gateway! I loooved it. My boyfriend even loves it and he's not sure where he stands with God. Awesome post, Ruthie! Thanks for your honesty! That sounds like a really powerful study! It's amazing to see what God taught you through it! You are so inspiring and such a huge encouragement to me. Beautiful heart and I love what God is doing. I really need to get involved in a bible study group! This sounds like a great book! Thanks for sharing about it - I think I may have to pick this one up! Very cool, Ruthie. In the teachings I follow, it's called "practicing the presence of God." I know from my own life that it can be very hard to do! We get wrapped up and forget about God. The 60 minute reminders are a great way to start developing that habit :) Thanks for sharing. Wow, Ruthie! This is amazing. I'm so glad that you got so much out of it. I'm thinking about seeing if the library has this book! This is awesome. I actually just got a tattoo of the word "Abide" that is another phrasing of that 'remain' that you quoted from John 15. I love these little reminders to be continually walking in God's spirit...even when it's annoying =) Thanks for sharing from your heart. Loved it and will definitely be checking out this book. How awesome that you are leading a study! What an awesome challenge.